Snow shoveling is part of almost every snow contract. Whether it is shoveling steps, keeping the entrance of a doorway free of snow and ice buildup or when clearing a tight area too small for the plow to reach, ensuring your safety is #1 priority. Below are seven tips for Safe Snow Shoveling to keep in mind. 1. Snow removal often happens in the dark of night. Night traffic doesn’t stop for snow removal crews. In order to ensure safety, consider adding a safety reflector on your shovel. 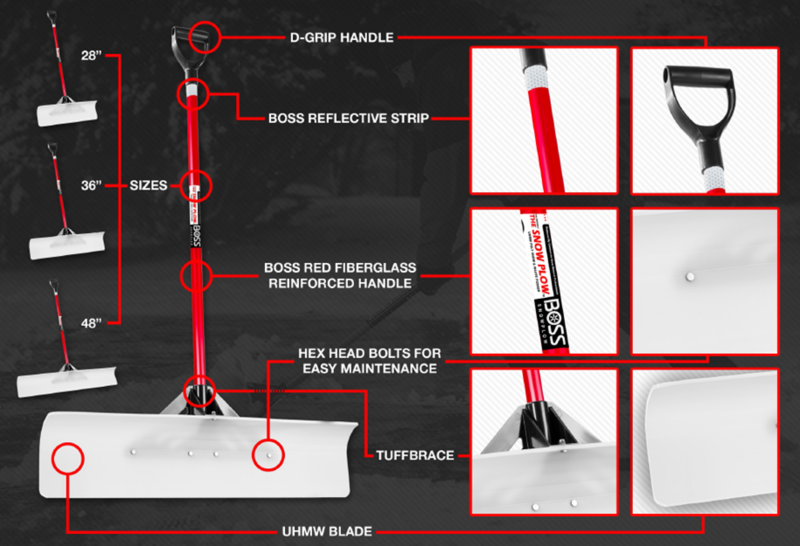 The Snow Plow Snow Pusher BOSS Edition by JM Enterprises, has a reflective strip near the handle of the shovel for increased visibility. Safety vests or jackets are another way to increase visibility and ensure safety. Plan for the Personal Protective Equipment you will need this winter. 2. Long hours spent doing snow removal can take a toll on your body. Proper ergonomics when shoveling can help prevent an injury. Proper ergonomics of shoveling suggest staying on top of the snow. Don’t let too much snow build up before trying to shovel. The sooner you can get out there and shovel the better. Clear the snow every few inches instead of waiting for the snow to build up or stop before you haul your shovels outside. The D-Grip Handle of the Snow Plow Snow Pusher was also designed for a comfortable and ergonomically correct position when shoveling snow. Designed to fit bulky, gloved hands to keep you warm and safe the D-Grip Handle will keep you comfortable and powerful to push through the snow. 3. More snow=more work. Shoveling snow is a workout so make sure your muscles are warm in the cold elements. Stretching before you start shoveling is a good habit to get into to help prevent muscle fatigue and injury. 4. Leave power lifting for competitive weightlifting contestants. Make sure you are pushing the snow to the side rather than trying to lift the snow to remove it. Pushing allows you to exert less energy and less stress on your body, especially your back. 5. There’s nothing worse than slipping and falling on ice or slippery snow. Make sure you are wearing quality outdoor winter shoes with good traction to help prevent an awful fall. 6. Keep your coat on. While your truck may be nice and toasty, the second you step out into the elements make sure you dress appropriately. Layer up with clothing so you can easily add layers from your truck or peel layers off as you get hot. 7. Stay hydrated! Shoveling is exhausting! Make sure you stay hydrated and take frequent breaks. Keep water in your vehicle and drink often. These are just a few important tips to keep you safe while out on the job. Be sure to check out the Snow Plow Snow Pusher with safety reflective strips as a great shovel that keeps your safety in mind!